The 2018 Rest Home Games were once again a hit with Tauranga residents, with 14 teams competing in the annual event. 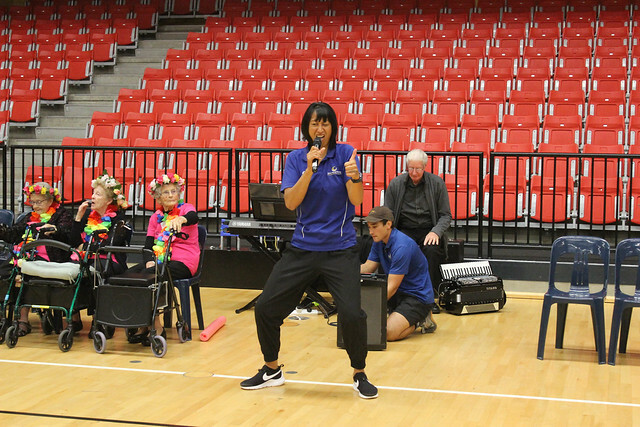 Hosted by Sport Bay of Plenty, the event sees teams of eight from various rest homes around the city compete in challenges such as noodle hockey, bean bag throw, ten-pin bowling and balloon badminton. Organised by the Play in the Bay team, in conjunction with Klara Luxford from Radius Matua, it's a chance for residents to get active, socialise with other teams and have a bit of fun. The morning starts with tea and scones, with some live music from by Ces and Joy Steer, before the teams get into the activities. This year's theme was Commonwealth Games, and the costumes did not disappoint - however the Cedar Maniacs from Cedar Manor won for being most in theme. As for the game, The Pyes Pa Stallions from Lodge Pyes Pa were the winners on the day, taking first place in all of their activities. Congratulations to everyone who took part and a big thank you to our Youth Engagement Team and the Sport Bay of Plenty staff for their assistance on the day. Thank you to Legacy Trust for supporting this event and to Decor Gardenworld for sponsoring the prizes.